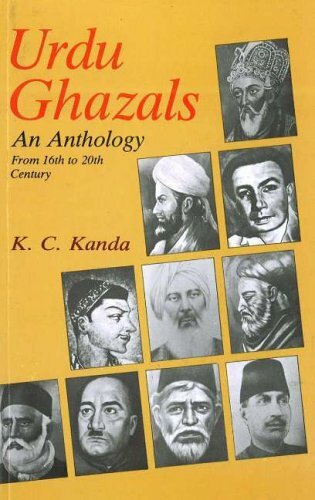 Of all the cultural imports to India from Iran, theghazalis the most beloved. Aghazalis a poem composed of couplets, either on the same theme (ghazal musalsal) or on unrelated themes (ghazal gair-musalsal). As a poetic form, it is somewhat difficult because of its rigid structural constraints. To begin with, it must only be composed of couplets, of which the first couplet, thematlais special. The matla sets the expectation for the rest of the ghazal because it establishes the structure and the metre as well as introduces theradeefand thekaafiyafor the ghazal. The radeef is the set of last words common to the first and second lines of the matla and the rules of the ghazal demand that the radeef should appear unchanged at the end of each subsequent couplet; thekaafiyais the word that precedes the radeef, and this is the word that has to rhyme in each subsequent couplet. For instance, in the below extract of a ghazal (1) by Ghalib, "mere aagey" (ahead of me/in front of me) is the commonradeefwhile "duniya/tamasha" etc is the rhymingkaafiya:Bazeecha-e-atfaal hai duniya mere aagey,Hota hai shab-o-roz tamasha mere aagey.Mat pooch ke kya haal hai mera tere peechey,Tu dekh ke kya rang tera mere aagey.Imaan mujhe roke hai jo kheenche hai mujhe kufr,Kaaba mere peeche hai kaleesa mere aagey.Go haath ko jumbish nahi aankhon mein to dum hai,Rehne do abhi saagar-o-meena mere aagey. There are many other rules that guide the composition, so given the structural demands, it is not surprising that the gair-musalsal form predominates, and this itself can pose problems for the novice to Urdu poetry; because each couplet of theghazal gair-musalsalis a complete and self-contained poem in itself, the mood can change dramatically from one couplet to another. Thus the sardonic humor ofYaksaan hai husn-o-ishq ki sarmastiyon ka rang,Unki khabar unhein hai na meri khabar mujhe. Alike are the intoxications produced by beauty and love,She is lost unto herself, and I am lost to me (2)can be abruptly followed by the deep angst of separation inMain duur hoon toh rooh-e-sukhan mujh se kisliye,Tum paas ho toh kyon nahin aate nazar mujhe?If I am far away, why does your soul speak to mine thus?And if you are close by, why are you not visible to me?Once these hurdles of the unusual rhyme scheme and sudden shifts in subject and mood are overcome however, the urdu ghazal has a lot of pleasure to offer. As the haiku is the poetry of imagery, so is the ghazal the poetry of emotion. Women, wine, love, yearning, separation and loss are its central concerns, and over the centuries some truly exquisite poetry has been created around these, poetry that is as soulful, passionate and melancholic as the finest love poetry in any language- in this, it succeeds admirably. It does not do so well however in its ability to keep reinventing itself as an art-form, so it can be said to be beautiful the way an arid landscape is beautiful, and just as static and unchanging. For, given the constraints of form, the only possibility for the art to evolve was in its content, and notwithstanding the attempts of a few contemporary poets in incorporating protests against the tyranny of religion or social injustices it has not evolved into a art-form of true socio-political significance. The aspirations that it could ever be a tool for social change have remained just that, because the Urdu poets never sought the same inspiration in nature or even the less loftier aspects of the human condition that poetry in other languages did- this in the Urdu ghazal is unlikely; this is inconceivable. So the result is a large body of work characterized by great innovativeness and diversity of expression but a relative homogeneity of content.As regards the anthology, there are a few problems. To begin with, the translations are serviceable, but often leave a lot to be desired. This can be overlooked; translation is after all an art in itself, and art allows for a multiplicity of interpretations, but a bigger problem is that some major poets have been excluded. In this, the title is misleading - no book can claim to be an anthology of Urdu poetry and exclude such names as Mir, Dard, Ghalib or Faiz. Ghalib's omission is particularly disappointing; he was the last truly great -perhaps the greatest - Urdu poet, a master composer who was original, irreverent, profound and witty, an iconoclast who injected a vigor and vitality into the Urdu ghazal that has not been seen since; even today, it is he who the young consider "cool" and excluding someone whose poetry they consider "wicked" is unlikely to encourage their readership, which is a worthy goal, because Urdu is a language on the decline in India. Another serious drawback is the absence of an index; there is no easy way to navigate the book. Still, the author does deserve credit for attempting to fill part of the void that exists in this domain. (1) Which roughly translates as:This world is like a child's playground in front of me,Night and day a masquerade takes place in front of me.Ask not how I have fared when you haven't been around,See for yourself what your color is in front of me. (3) Faith holds me back as infidelity exerts its pull on me,The holy Kaaba is behind me, a cathedral looms in front of me.So what if there's no movement in my hands, there's still some life left in the eyes,For now at least, let the goblet and the wine remain in front of me. (2) Or more literally: Alike are the intoxications produced by beauty and love,She is drunk on her own beauty, and I am drunk in my love. (3) i.e. See how pale I have become in your absence. K.C. Kanda - Kishan Chand Kanda has had a long and distinguished tenure as a Reader in English at Delhi University. He holds a doctorate in English from Delhi University, Master’s degrees in English from Punjab University and Nottingham University, and a first class first M. A. degree in Urdu from Delhi University. He has published 10 books of Urdu poetry translations and is the recipient of the Urdu Academy Award for excellence in translation.